Computer is an electronic device used in almost every field even where it is most unexpected. That is why this age is called as the era of IT. Computer has become very important nowadays because it is very much accurate, fast and can accomplish many tasks easily.That’s why all school has included now computer as a subject in their syllabus. It is better now to start learning computer from school age, so, student when reach to college age, then can be expert in this particular subject. TCCI-Tririd Computer Coaching Institute is a best institute in Bopal and satellite in Ahmedabad because teaching by qualified and experienced faculty through different learning method/media.Material also has been provided to students as per their requirement. Faculty teach always as possible as easy manner. Our teaching method as per Board Exam help them to grasp knowledge in best way. 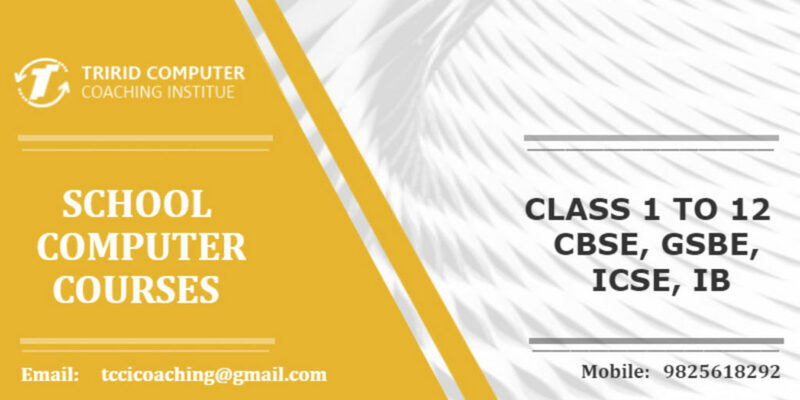 We teach CBSE, GSBE, ICSE, IB school computer syllabus to students,Students who have learnt at TCCI have got good result in their examination. This is our award really.